Lots of boys are fascinated by firetrucks, trains and airplanes and would like nothing more than a chance to get near one and maybe even tour one. 6-year-old Henry Mitchell is no different. He loves big trucks of all kinds and often runs out near the street to get closer and to watch them pass and work. Last month, for his sixth birthday, Henry got to realize his dream and see one of these machines extra close. On the morning of Dec. 31, as he was celebrating with his friends and older brother at his birthday party, another big truck came down the road by his house. But instead of passing as most do, this big blue truck with a picture of a large black bear on the side lumbered to the side of the road and growled to a stop at the curb just outside Henry’s house. The truck was a document shredding truck from RK Black Shredding. It had stopped there as arranged between an RK Black associate and Henry’s parents after the associate had heard of Henry’s fascination with trucks. Not only did Henry get a chance to see the truck up close, he got to get the grand tour as well. “We showed him how everything worked. He got to sit in the cab and hold the steering wheel and honk the horn,” said Mike Kelly, Shredding Operations Manager for RK Black Shredding. 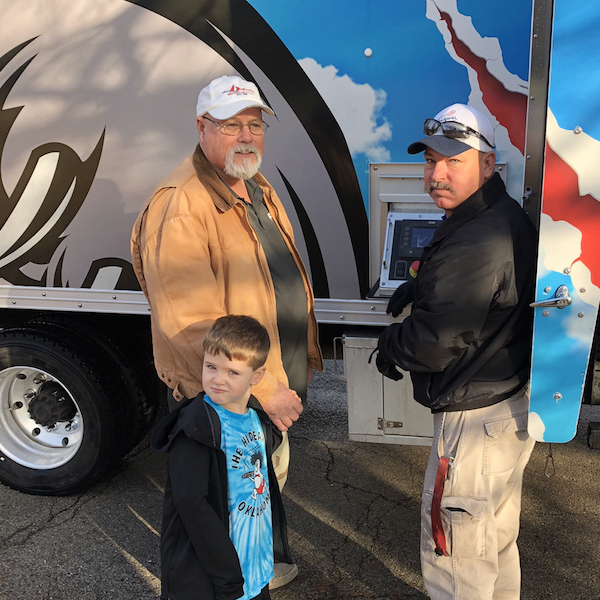 As each of the boys attending the party had been asked to bring a bag of documents to be shredded, Henry and his friends were able to see the shredding truck in operation. They watched through the truck’s monitoring screen as their records were destroyed. After the demonstration, RK Black Shredding capped off the visit with a box of donuts which the boys promptly destroyed. RK Black Shredding, in the business of bringing ease to people’s minds, ultimately seeks to bring smiles to people’s faces, especially if they are little boys.